Can I tell you how much I love the Christmas holiday? Every year we transform our home into a Christmas wonderland. 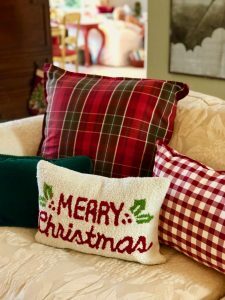 Simple things like switching out your regular throw pillows to holiday and festive can really make a huge difference. It seems that every year, retailers are trying to get us to skip Thanksgiving and go right into full Christmas mode. Well, I happen to LOVE the fall and Thanksgiving is my favorite holiday. I think it is the fact that there are no pressures to find the right present for anyone. It’s all about football, turkey and the fixins’. 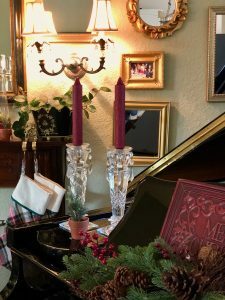 We always wait to transition from fall frenzy décor to Christmas décor the weekend and week after Thanksgiving. It is a two-step process. First, I remove all of the fall decorations. Then, the dishes and glassware are switched out. 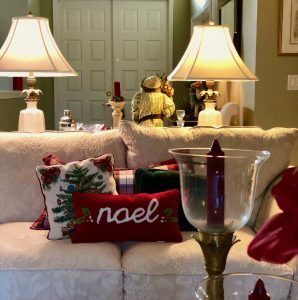 All of the pillows are replaced with fun, and festive Christmas themes and my Santa collection is distributed throughout the house. 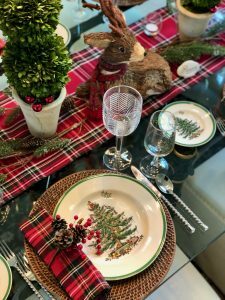 We are probably a little “over the top.” We have several sets of Christmas dishes and a whole assortment of Spode glassware and also mugs for our morning coffee that are used throughout the season. 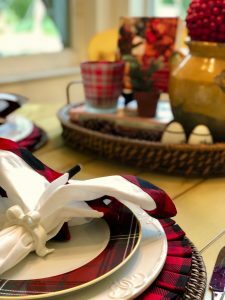 My Scottish heritage is really coming to light with all of the tartan bows, dishes, pillows, throws, and more. The red color “pops” and even though we have used tartan accents for many years, it seems to be a strong trend this year. 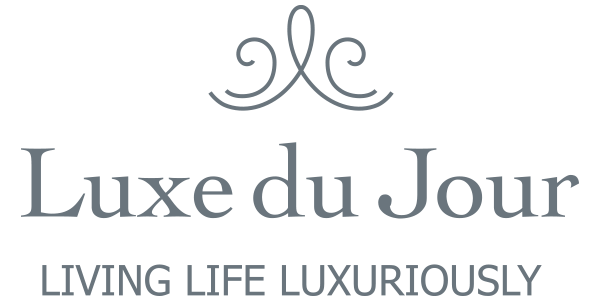 You can have a luxe holiday and find some incredible items at places like Homegoods, TJ Maxx, and Marshalls. 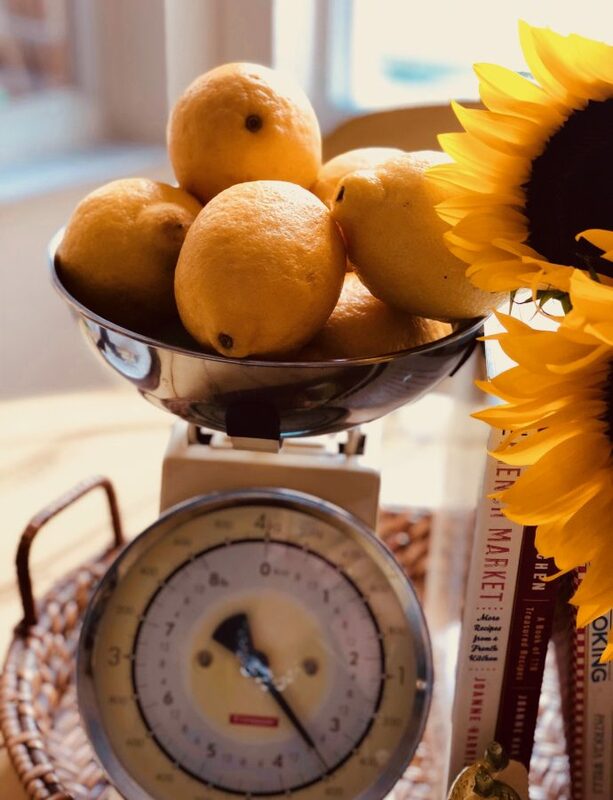 Homegoods has a beautiful selection of pillows, candles, gift-wrapping items, and just about everything you need to transform your whole home. You will see many examples of these selections in my photos. Even our outdoor space gets some holiday “touches.” It is finally cool enough to sit outside and enjoy the great weather. We added some pillows, throws and bows to add some holiday ambiance. 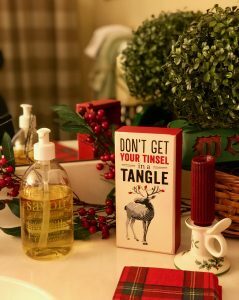 The powder room gets a little something to make it festive, too! 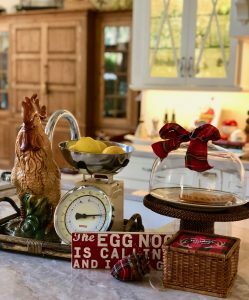 Close Up Of Kitchen Island Vignette – The Eggnog Is Calling And I Must Go! Here is a picture of our mantle. 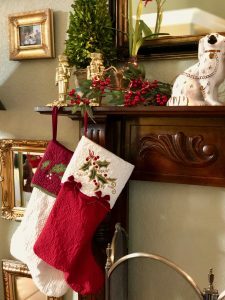 I love these stockings and having a mantle provides the perfect place to hang them. The fireplace is electric and gives that nice warm feeling that we really can only enjoy a few times during the year here in South Florida. 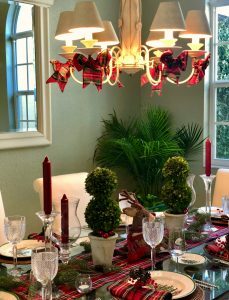 Another creative way to decorate is with holiday books or decorative plates. I have an extensive collection of Spode dishes and have some of these on display. I got some inexpensive plate stands and just prop them up throughout the house. See, luxe does not need to be expensive. You can get these at Homegoods or Michael’s Crafts. 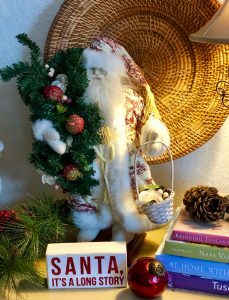 Another holiday tradition includes adding decorative Santas to our decor. Many years ago, my brother gave me a Santa as a Christmas gift. Well, now we have acquired quite a collection. One is sitting on our piano, there are Santas in the powder room and other bathrooms. They just add that special “something” to each area. 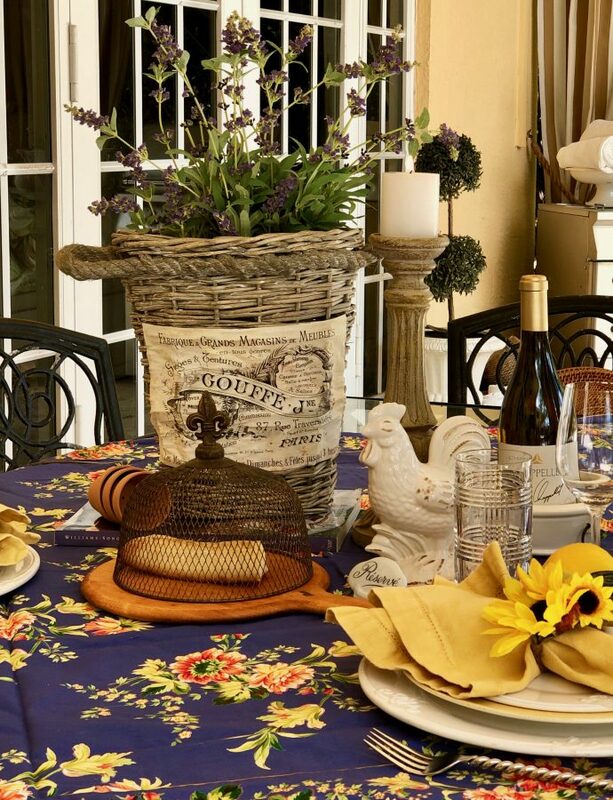 We not only shop at the discount stores, many of the items are from Williams-Sonoma, Pottery Barn and Stein Mart. Stein Mart is a great place to find Spode china and glassware. I got some great Spode champagne flutes last year – cheers! 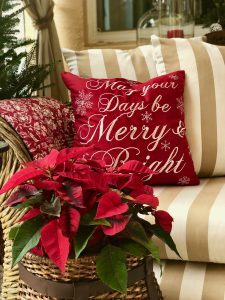 Our topiaries outside on our patio have been embellished with tartan bows, poinsettias are in place in the planters surrounding the pool, and everything looks very festive. 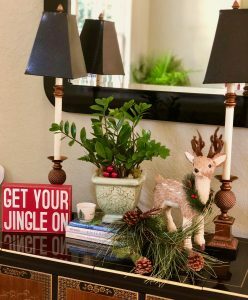 Just like in our family room, we have some greenery in our planters and swap out the flowers in the middle of the planter to suit the season. 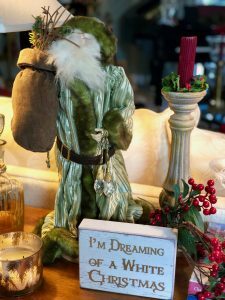 Have you seen the cute signs with Christmas sayings on them at the home stores? I love these! We have several signs with fun sayings like “Don’t Get Your Tinsel In A Tangle,”“Sorry Santa Naughty Just Seems So Nice” or “Get your Jingle On” just to mention a few. These fun signs make great gifts too! Anyway, we are having fun making our house a festive place to spend the holidays. Cheers to you and yours and stay tuned for our tree unveiling….coming soon! Hi Kim! 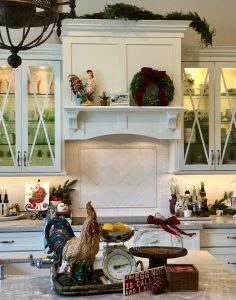 Your home looks so cozy and welcoming for the holidays, and I would feel delighted to simmer something fragrant in your beautiful luxe kitchen (and I love your idea of luxe!). 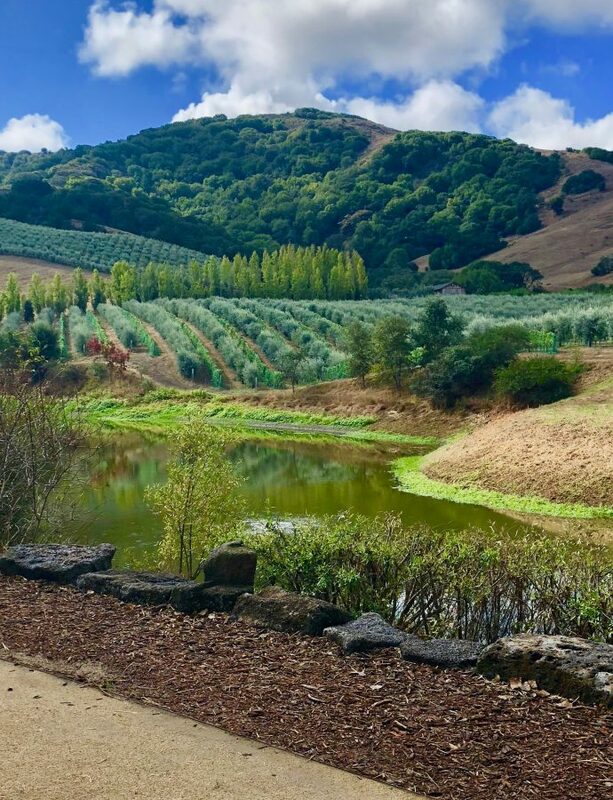 Best to you as you share more of your journey and lifestyle on the blog! My name is Kim and my passion is surrounding myself, family, and friends in a life of luxury. 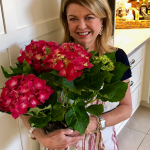 Each week, I’ll share with you new tips and recipes to create a luxurious life .